Mayor Jenny Durkan wants to set up a pricey cordon of photo tolls around downtown, to ease congestion. There is another way — one that won’t cost the commuting public — if only city leaders weren’t so bent on extracting revenue. Regular readers know — in fact are probably already rolling their eyes — about my longstanding jihad against tolls. Partly it’s because I’m a cheapskate, it’s true. But partly it’s driven by reporting I’ve done over the years about how the state’s system of photo tolling and fines can break you when you’re poor. A few years ago I went through a series of tolling-appeal cases and found examples of how enormous 520 bridge toll bills, some topping $10,000 with all the fines, had, no joke, caused some low-income drivers to file for personal bankruptcy or even flee the state. This wasn’t just a few anecdotes. At one point three years ago, before the state finally agreed to ease up on its rigid fine collection, an astonishing 90,000 local drivers owed $53 million in back tolls and fines. Unable to pay, some of them simply abandoned their cars when the state placed holds on their license tabs. I bring all this up now because the Seattle mayor just proposed tolling all of downtown as a way to reduce congestion. Congestion pricing definitely works. It’s simple: The city charges a toll to drive in the most traffic-clogged neighborhoods. In London, a $16 charge has cut traffic to its central core by 15 percent. Mayor Jenny Durkan, at a news conference this past week, said money is the obvious tool to unclog Seattle’s traffic mess. That’s the Seattle answer to every problem: “You’ve got to pay more money!” This is all well and good for folks with disposable incomes, or with alternate means to get around. But as the 520 bridge debacle showed, it can be brutal to a small subset of the low income. There hasn’t been much study of the effects of tolling on the poor. 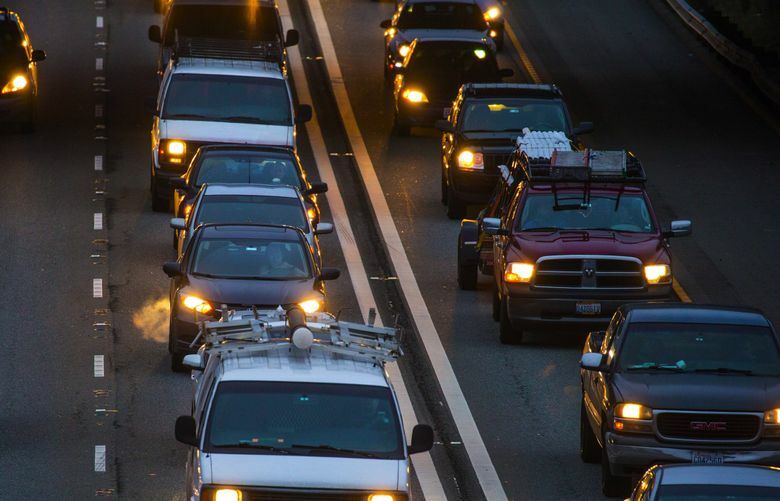 In 2009, University of Washington researchers took a crack at the issue, and their findings, while overall positive about tolling, raised some red flags. They found that low-income drivers are less likely to use tolled roads, and so would pay less in tolls annually than higher-income drivers. Over the broader population, that means tolls are actually less regressive than, say, the gas tax. But for a small subset of the poor who have no obvious alternatives to driving on the tolled routes, the costs could consume a huge portion of their yearly incomes — up to 15 percent. Every tolled project is unique, so these results can’t be automatically applied to Durkan’s idea of a tolling cordon around downtown. But it’s easy to imagine how folks who drive work trucks for a living might be crippled by $16 tolls. We are already becoming a city of millionaires and homeless, with little in-between. So why not ration the road space rather than charge for it? I’ve suggested this before, in my idea to cut back traffic to South Lake Union. Some other cities have set up a rationing system based on license-plate numbers. If odd and even plates won’t work, maybe we use a system of official stickers. The point is, there are other ways to reduce traffic without nickel-and-diming — or more accurately, 10-and-20ing — an already price-shocked public. I agree with the mayor on one thing: Something’s got to give downtown. But it needn’t be the backs of the working poor.